St. George Island’s beaches have been ranked in the top 10 beaches by Dr. Beach for many years. Great for swimming, fishing and pet friendly with the exception of the Julian G. Bruce St. George Island State Park, which doesn’t allow pets. The public beaches are great for swimming, fishing, seashell searching and relaxing walks with your loved one or furry friend. If you’re looking for a beach with amenities check out the Julian G. Bruce St. George Island State Park. It is a great option offering sufficient parking, large covered pavilions with picnic areas, grills and a boardwalk onto beaches. Wheelchair accessible beaches plus some beach and floating wheelchairs available upon request. If surf fishing is of your interest, the East End Fishing Beach, located at the end of the State Park is a great option. Only accessible by permit, the beach is one of the most popular fishing areas of Florida’s Forgotten Coast. 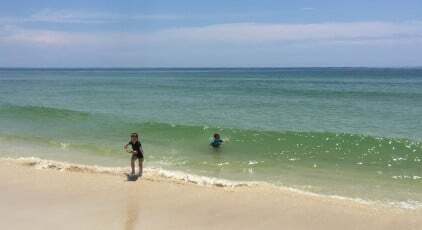 On the bay side of St. George Island is the Unit Four Beach, great for nature lovers or people with small children as it offers very little surf and shallow waters to play in. The beach also offers more shade and seclusion than the public or state park beaches.